The Ministry of Education and Human Resource Development is working towards restoring the education system to a sense of normalcy following the devastation of Hurricane Maria. 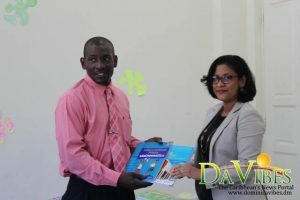 That’s according to Assistant Chief Education Officer, Dr. Jeffery Blaize who was speaking during a handing over ceremony at the Newtown Primary School of 18,000 pounds worth of text material to the Ministry of Education from Hodder Education on Wednesday 23 May 2018. A Post-Disaster Needs Assessment, requested by government to assess the disaster impact to inform recovery and reconstruction needs, revealed that the education sector suffered damage and losses worth two hundred and eight million EC dollars. Educational facilities, including daycare centers, suffered varying degrees of damage as a result of the storm. Of a total of one hundred and sixty-three facilities, sixty-seven suffered major damage and will require reconstruction. The post-disaster needs assessment, coordinated by the World Bank in conjunction with the United Nations, Eastern Caribbean Central Bank, the Caribbean Development Bank, and the European Union, also revealed that a total of fifty-two school facilities will require major repair and seventeen facilities will require minor repair. The remaining twenty-seven facilities are reported without damage. Overall eighty-three percent of schools reported some level of damage. Damages include destruction of teaching materials, furniture and equipment and other educational resources. The Assistant Chief Education Officer, Dr. Jeffery Blaize stated that that the system has progressed immensely since last September as officials have been “at the wheel from September 19 trying our best to restore the education system to a sense of normalcy”. Dr. Blaize noted that the ministry and the education system can be described as “resilient” when considering the progress it has made in spite of the circumstances presented to the Ministry by Hurricane Maria. He highlighted the importance of the Hodder Education contribution as well as the importance for students to be focused especially during this post disaster time. “I need to send a message to our students and also to our parents. Our students have settled very well subsequent to Hurricane Maria, and they deserve kudos for that,” Dr. Blaize stated. He said although the circumstances may not be as comfortable as the ministry would have liked it to be, “but we have adjusted, and that in itself is resilience. So we can say that the education system is resilient”. “I want to congratulate our students for their level of focus and for the way that they have settled back into their environments,” Dr. Blaize said. In the next three to four weeks, the National Assessment at Grade 6 level will be taking place and according to Dr. Blaize, “from observations we believe that our students will be ready for that”. He further urged parents to be patient and continue supporting and working with the Ministry as it continues to work towards normalcy. “We want our parents to continue working with the Ministry of Education, continue supporting the students, because now more than ever we need the support of parents. We need the patience of parents, we need them to be tolerant of our work and work with us as we restore the education system to a sense of normalcy,” Dr. Blaize said.